Our new version mxODBC Zope DA 2.0 was changed to conform to the new layout and installation system used by Zope 2.12 running Python 2.5 or 2.6. It is easily possible to integrate the mxODBC Zope DA installation into a zc.buildout setup or to install the product manually using easy_install. Due to popular demand, we have also backported the new version to Python 2.4 for use with the older Zope 2.10 and Zope 2.11 releases. If you need database access for even older Zope releases, please consider using the previous release of our mxODBC Zope DA product, which supports Zope 2.3 - 2.11. Starting with mxODBC Zope DA 2.0.1, the Zope DA is now again compatible with Plone 3.2 and later. It fully integrates into the zc.buildout installation system used by these Plone versions. Plone 4.0 is supported as well. 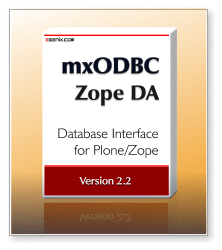 For older Plone versions, please consider using the previous release of our mxODBC Zope DA product. Compatible with all recent Zope and Python releases: Supports Zope 2.10.9+, 2.11.4+, 2.12.x, Python 2.4, 2.5 and 2.6. If you need support for older Zope releases, please use version 1.0.10 of our mxODBC Zope DA. Compatible with Plone 3.2 - 4.0: The zc.buildout compatible installation process allows easy integration with your existing Plone 3.2 - 4.0 installations. You will need to have one of popular ODBC managers for Unix installed on the target system: iODBC 3.52.x or unixODBC 2.3.x. We have successfully tested the Zope DA with iODBC 3.52.7 and unixODBC 2.3.0. Even though the mxODBC Zope DA 2.0 does not officially support Plone 4.1 or Zope 2.13, you can still install the product if you add two additional dependencies to your buildout.cfg file. The two products ThreadLock and ZSQLMethods were removed from the Zope 2.13 standard installation and now need to be explicitly added to the dependency list for the Zope DA to work. Note: Be sure to pin down the versions as indicated in the above example. In a ZEO setup, each client will have to get a license, so you need multiple [egenix-mxodbc-zopeda-license] sections in you buildout.cfg, one for each client.